We’ve seen portable printers and mobile scanners before, but according to HP, the Officejet 150 Mobile All-in-One is the world’s first portable all-in-one device, enabling you to print, scan and photocopy on the move. It could be of real interest to business travellers who spend a lot of time in hotels, away from the company laser printer or their home office all-in-one inkjet printer. The HP Officejet 150 Mobile can be powered from the mains electricity or by using a supplied rechargeable lithium-ion battery that’s good for around 500 prints. It connects to your Mac or PC over USB or Bluetooth, but if you opt for the wireless protocol, you can only print – scanning is only possible on a USB connection. There’s no support for Wi-Fi or Ethernet networking, so don’t expect features that rely on a network or internet connection such as Google Cloud Print or AirPrint. You can print, scan and copy from the 6cm/2.36-inch colour touchscreen, and scan to your computer, USB flash drive or memory card. The paper feeder – which doubles as the lid when the printer’s not in use – can hold up to 50 sheets, but you have to feed your pages one at a time into the scanner. Because it’s a sheet-feed rather than flatbed scanner, it’s not much use for scanning books or magazines unless you’re prepared to destroy the original. The HP Officejet 150 Mobile is portable enough to slip into your suitcase for that business conference or research field trip, but since it measures 35 x 17.1 x 9cm (13.98 x 6.95 x 3.52 inches) and weighs 3.1kg/6.8lbs with the optional battery fitted, it’s too big and heavy to casually slip into your briefcase or notebook bag. It’s not to be taken lightly as a financial investment either. 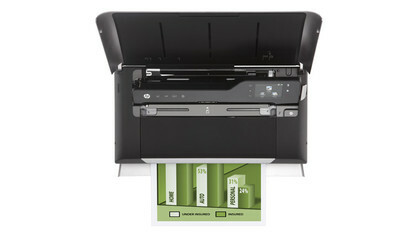 With a full price of £269/US$399.99/AU$449 it’s considerably more expensive than most multi-function inkjet printers. A standard black ink cartridge costs £20.99/US$25.99/AU$31 and the tri-colour cartridge is £22.99/US$31.99/AU$40.99. The black cartridge lasts for approximately 423 prints and the colour for 330 prints, giving an ink cost per page of 5p and 7p respectively, in the UK. Again, this is more than you’d pay for a regular inkjet multi-function printer. 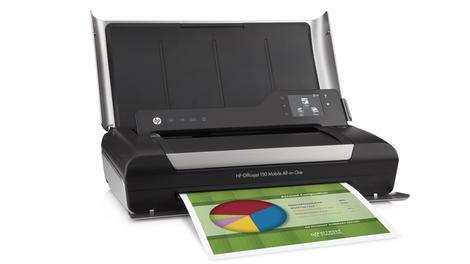 Given its running costs and its lack of network connectivity, the HP Officejet 150 Mobile is best used as a supplementary printer to use on the move rather than a main, at-home device you can also take away with you. As a printer, the Officejet 150 Mobile puts in a performance that belies its small size. It certainly makes few compromises in quality. Text printing, the heart of an Officejet’s remit, is clear and vivid. Maybe it’s not quite as sharp as a desktop Officejet, but the difference is slight. It printed our 20-page text document in just under four minutes. 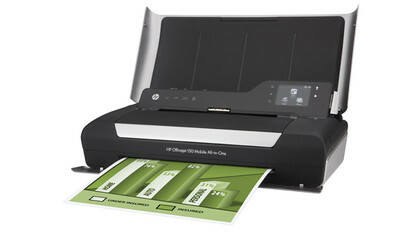 Again, a desktop HP Officejet is likely to prove faster, but for a mobile printer, it’s an acceptable speed. HP’s promise of ‘lab quality’ photo prints is a little too optimistic. The colours are slightly artificial and could do with being a little more vibrant. Even so, our A4 (US letter) sized, highest-quality photo test printout on photo paper looked pleasingly sharp and consistent. Colour ramps are smooth, if slightly speckled, and details are well realised. It took 6 minutes 40 seconds to print, which isn’t great, but you wouldn’t really expect a portable Officejet printer to deliver speedy high-quality photo printing. Given the nature of the printer, you’re far more likely to use it for plain paper documents than quality photo printouts. Thankfully, it puts in a solid performance here too. Printing a text and graphic information sheet, colours were strong, text clear and images well reproduced. There was very little banding too, which is something that often curses lesser inkjet printers. But it wasn’t perfect. The colours were a little too strong and images a trifle speckled in places, but you wouldn’t be embarrassed to hand it out at a meeting. Just don’t expect the same quality you get from the office laser printer. Plain paper, default-quality photo prints aren’t as strong, since speckling becomes far more apparent. Unfortunately, the Officejet 150 Mobile All-in-One is less successful as a scanner. It’s slow, taking 1 minute 20 seconds to scan an A4 (US letter) sized page. You can’t scan over a Bluetooth connection, either. Images can look speckled, though blacks are strong and white space blemish-free. It’s a sheet feed scanner, so you can’t scan anything thicker than heavy paper, but in our tests it handled a glossy magazine cover OK. The bottom of a page can get stretched too, which is problematic if the image goes all the way to the foot of the paper. 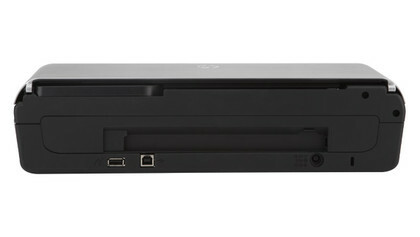 It certainly can’t replace your trusty flatbed for serious scanning. Photocopies are surprisingly good, lacking much of the speckling that affected image scans. There were a few horizontal imperfections caused by an inconsistent feed, but overall, they were good. One thing that certainly can’t be faulted is the printer’s build quality. It’s an incredible piece of engineering, cramming so much into such a small piece of kit without anything looking tagged on. 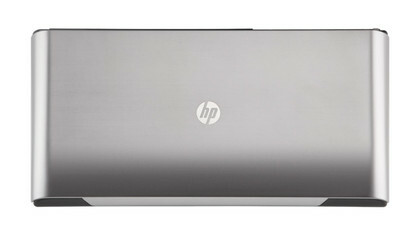 The HP Officejet 150 Mobile portable printer, scanner and photocopier brings the mobile office one step closer. At last, you can take your multi-function device on the road with your notebook. It’s not quite light and portable enough to drop into your everyday bag, but it fits nicely in your suitcase. It’s an incredible piece of engineering, with outstanding build quality and an excellent use of space. Print quality is very good, although not quite up to the standards of a desktop Officejet. You can power it from the mains or the supplied rechargeable battery, and it connects through Bluetooth or USB. 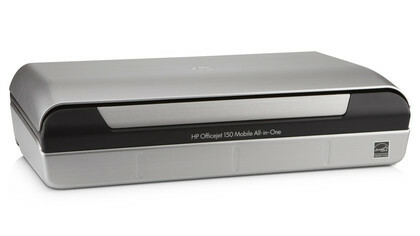 The HP Officejet 150 Mobile is expensive to buy, and costs more than average to run. Scanning quality is a mixed bag; it’s serviceable, but not up to the same standards as the print quality. It’s not the speediest of printers either. Text-print speeds are acceptable for a mobile device, but photo printing speeds are slow. HP’s Officejet 150 Mobile All-in-One portable printer is a useful device for the business traveller or researcher who spends a lot of time away from home or the office. Due to its high running costs and lack of networking connectivity, it’s best used as a supplement to rather than a replacement for your regular MFD, but if you often find yourself in a hotel room wishing you had a printer and scanner with you, it’s definitely worth your consideration.